AFTER READING PLEASE CLICK HERE TO ANSWER STUDY 1 QUESTIONS. AFTER READING PLEASE CLICK HERE TO READ STUDY 1 COMMENTS. BEFORE READING PLEASE CLICK HERE TO VIEW AN OUTLINE OF LUKE WITH LINKS TO ALL THE QUESTION SHEETS. BEFORE READING PLEASE CLICK HERE TO VIEW AN OUTLINE OF LUKE WITH LINKS TO THE COMMENTS. BEFORE READING PLEASE CLICK HERE TO VIEW A COMPARISON OF JESUS PARABLES IN THE GOSPELS. Author. The author's name is not mentioned in the book. This gospel account is a companion of the Book of Acts. Both are addressed to the same person, Theophilus and uses the same writing style. Acts often use the word "we" when recounting events. So though elimination and examining Paul's letter it can be determined that Paul's "dear friend" the doctor Luke (Colossians 4:14) wrote both this gospel account and Acts. He is called a historian because of these two books. Second century writings agree that Luke wrote both. Luke was a Gentile about the same age as Paul and was his constant companion for about the last twenty years of Paul's life. Paul probably led Luke to the Lord. He joined Paul on his second missionary journey. Luke was a gifted scholar and physician, and from his Christian life shined forth such admirable traits as kindness, loyalty, faith and exuberance. New Testament references to him (outside of Acts) are Colossians 4:14; Philemon 24; and 2 Timothy 4:11. Date Written. Luke apparently finished writing this gospel and Acts around A.D. 61 while Paul was still imprisoned in Rome (Acts 28). 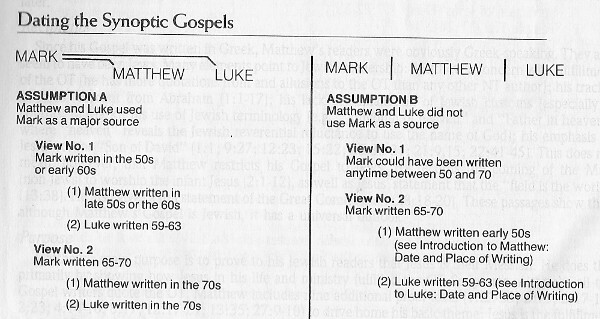 See chart "Dating the Synoptic Gospels". Place Written. The place of writing was probably Rome, though Achaia, Ephesus and Caesarea also have been suggested. The place to which it was sent would, of course, depend on the residence of Theophilus. By its detailed designations of places in Palestine, the Gospel seems to be intended for readers who were unfamiliar with the land. Antioch, Achaia and Ephesus are possible destinations. Purpose and Recipient. The Gospel is specifically directed to Theophilus (Luke 1:3), whose name means "one who loves God" and almost certainly refers to a particular person rather than to lovers of God in general. The use of "most excellent" with the name further indicates and individual, and supports the idea that he was a Roman official or at least of high position and wealth. He was possibly Luke's patron, responsible for seeing that the writings were copied and distributed. Such a dedication to the publisher was common at that time. Style. Luke had outstanding command of the Greek language. His writing style ranges from classical Greek to Semitic. He does an excellent job of revealing geographical and cultural sensitivities. When Luke refers to Peter in a Jewish setting, he uses more Semitic language than when he refers to Paul in a Hellenistic setting. Theme The main theme is the nature of Jesus' Messiahship and mission. Prominent Subjects The following subjects, because of their prominence in Luke, reveal something of the gospel's theme. The Person of Christ. Luke presents Jesus as Son of God (Luke 1:35) but especially as Son of man. The work of Christ in redemption. References to grace and the glad tidings occur throughout the book. Christ is the gracious Savior of mankind (Luke 19:10). The work of the Holy Spirit. The Holy Spirit is referred to more in Luke than in Matthew and Mark combined. Read Luke 1:15, 35, 41, 67 2:25-26; 3:22; 4:1, 14, 18; 10:21; 24:49. Christ's ministry to Gentiles. For example read Luke 2:32. The needs of the humble estate. Women, children, and outcasts appear often in Luke's story. For example, women are mentioned in all but five of the chapters. Enemies of Jesus. Luke shows Jesus as One who did not spurn His many enemies but shared the truth with them. Historical perspective. The factual basis of the gospel is underscored by the inclusion of many references to dates and secular rulers. Prayers of Jesus. As mentioned earlier, the prayers of Jesus are prominent throughout the book, emphasizing His humanity. Luke contains more of Jesus' parables than the other three gospels. See link above "A COMPARISON OF JESUS PARABLES IN THE GOSPELS".